The brethren of the Eastern US Field invite YOU to participate in their prayer line starting on February 24. 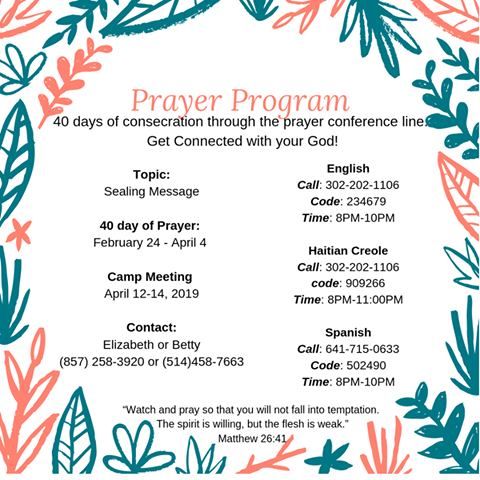 The prayer line will be held in 3 languages (English, Spanish, and Creole/French), via the telephone every evening from 8-10pm EST, and will last 40 days. The topic is the sealing message. Every day for 40 days there will be a season of prayer and consecration, followed by a presentation pertaining to the topic of the 144,000 and the sealing time. The phone line number is 302-202-1106 access code 234679.